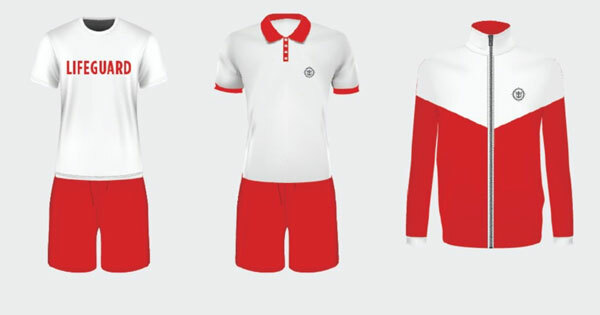 Lifeguard Uniforms on Royal Caribbean ships. One of the largest and most well known cruise companies in the world, Royal Caribbean International, will now be adding lifeguards to their cruise ships. For years, Royal Caribbean has held to the belief that safety aboard their ships is in part the responsibility of their passengers. Now, the company has changed their guest safety policy to include lessons on water safety for children onboard, as well as trained lifeguards at every pool. The anticipation about Royal Caribbean’s changing stance on lifeguards began with an ad posted on a website requesting applicants for the position of Lifeguards for Royal Caribbean ships. On February 24, 2017, images of Royal Caribbean’s new uniforms and signs with the new water safety policy were posted on CruiseCritic.com, which broke the news. Royal Caribbean has since confirmed they will be adding lifeguards aboard all their ships. Lyan Sierra-Caro, manager of corporate communications at Royal Caribbean International, has stated all lifeguards will be trained and certified by StarGuard Elite, an industry leading International Aquatic Risk Prevention and Lifeguard Training program. Drownings aboard cruise ships, in addition to “man overboard” accidents, are as old as the industry itself, although very rare. The public controversy over shipboard water safety dates back to 2013, when a 4-year old boy nearly drowned in a pool while onboard a Disney Cruise Lines ship. Following the tragedy, Disney Cruise Lines began providing lifeguards at every pool, and until now has been the only company to do so. Since then, more drownings and critical incidents have occured, and the topic of cruise ship safety — especially who holds responsibility for watching children at play in pools — has become more prominent. Last year Cynthia Martinez, spokesperson for Royal Caribbean, explained the companies view on the topic: “We do not have, nor plan to add lifeguards aboard our ships.” Royal Caribbean’s policy has changed but, perhaps due to mixed opinions among passengers surveyed, Royal Caribbean International has not publicized it to the general public. 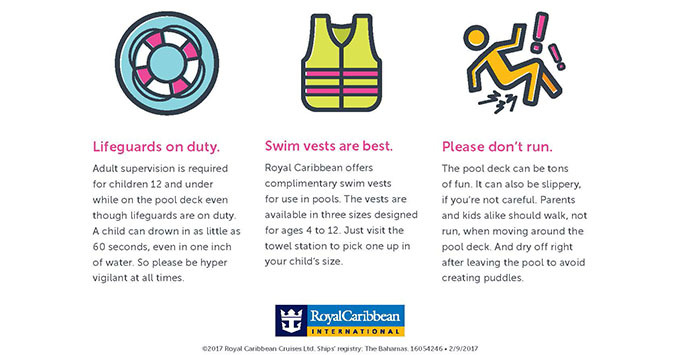 Royal Caribbean’s long time safety policy has mainly focused on educating passengers on water safety. They have a muster drill on every voyage, which teaches guests what to do in case of an emergency. They also show guests how to properly put on a life jacket. The new family water safety program will provide swim vests for children ages 4-12 at each pool, as well as presentations on water safety in both the Adventure Ocean Kids and teen 411 programs. Trained lifeguards will be added to every pool during operating hours, and gear and safety guidelines will be provided to guests throughout the ship. This change is a big step towards improving safety aboard all cruise ships and reason enough, in our view, to cruise with this company above others. The campaign began in March of this year on the Oasis of the Seas, and by June 2017 every Royal Caribbean ship will have trained lifeguards on board. For more information about family cruise vacations, see our Cruise with Kids directory or contact Royal Caribbean directly.